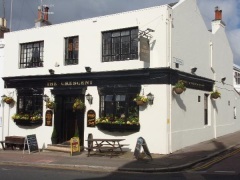 The Crescent, Brighton & Hove, BN1 3HL. The Crescent pub review, map and rating. Looking for a Hotel near The Crescent? The food at the crescent is fantastic now and great value for money.Sunday Roasts are the best in town Also a great selection of beer and lagers. Doombar has appeared recently.The atmosphere is as good as it gets. The Crescent pub is a locals pub with very welcoming staff and delicious pub food. The Sunday roasts are certainly not to be missed. Large beer garden which is great in the summer!